What counts as your last moment in a place? Is it when your departing plane’s wheels lose contact with the ground? When you lock your apartment door behind you? When you tape up the last box of your stuff and load it into your storage room at 4 a.m.? When you say farewell and “see you next year” to the last friend? Our last night in San Francisco, we leave the 3300 Club with a few friends – and one very generous new guy named Dylan – who have all happily or drunkenly agreed to carry our heavy bed over to Dan and Jesse‘s place, where it will be reborn as their guest bed. 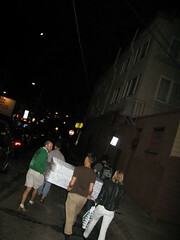 The half-dozen of us chant nonsensical rhymes as we march with the mattress and box spring from our apartment, down side-alleys and along Mission Street, and up a long flight of stairs at 10:30 on a Thursday night. At the end we reward Regina, Jesse H., Jesse S., Michael, and Dylan‘s hard work with home made latkes. As we get ready to leave the 3300 Club, Zoh the bartender, hands me two worn, wooden drink tokens and says “Take these with you on your trip. Either you’ll meet someone along the way who needs them or you’ll use them when you come back. The bar’s number is on the back, in case you want to call.” This is the first conversation I’ve ever had with Zoh. 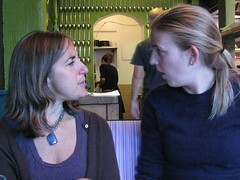 Ex-coworkers turned friends Rae and Nygaard both covetously gape at photos of a mostly naked, well-endowed David Beckham in between sips of rose wine and bites of huitlacoche dumplings at Lolo. Pierre, who is originally from Paris, walks into our apartment carrying a baguette under his arm, which he explains is his afternoon snack. Todd swings by Drewes Bros. Meats, our favorite butcher, to get ingredients for the gigantic vat of jambalaya that will feed the hordes at our going away party. One of Drewes’ owners excitedly provides Todd with andouille, hot links, and smoked ham, and talks about his attempts to perfect the crusty rice essential to paella. 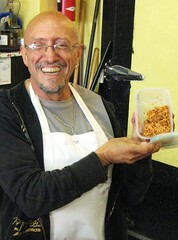 A week later, Todd returns to Drewes and presents the owner with a serving of our meat-laden jambalaya. At our going away party, which is also a garage sale, Kim acquires the most eclectic assortment of goods: a photo I took of a purple-scarf-wearing woman peeing on the sidewalk at the Folsom Street Fair, a mostly unused book of Sad Libs, and a BBQ’d vegetarian corn dog. Steve the Vegan visits San Francisco to bring down the corporate hegemonic superstructure by suing some multi-national oil companies over MTBE. This is not surprising. 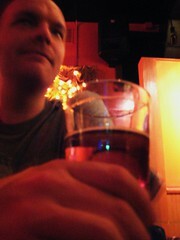 What is surprising is that Steve, who has been a straight edge for much longer than the decade we’ve known him – which means no alcohol, no animal product consumption, and some serious punk rock – toasts our trip with a shot of Jameson and a beer back. Looking forward to reading about your travels… Oh, and when you guys are in India, do you plan on going to Pushkar to check out the camel festival? I’m biased, but the narrative is fab and makes me nostalgic for L&T in SF.